One of the most difficult utilities to live without, if you're still intent on living a modern life, is electricity. Water is obviously essential but can be obtained naturally and telephones, internet, mobile phones and gas can all be given up with a little bit of thought. But with all the computers, entertainment and cooking devices largely relying on electricity, even if you don’t use it for heating, and the desire to carry on doing things through the evening relying pretty much on electric lighting, it would be hard, though not completely impossible, to live without it. So if you want to get away from paying the utility companies for electricity and carry on living the modern lifestyle, your only option is to make your own. Photovoltaic (PV) solar panels, that is, ones that generate electricity rather than those that heat up water in tubes, are still quite expensive, but can generate a decent amount of electricity as the technology evolves. The trouble is that it's generated when the sun's out and you need most of your electricity when the sun has gone down. It's worth pointing out here that although there are referred to as 'solar' panels, it is light that these panels use, not heat from the sun, so they still generate power on grey overcast days, just not as much as a longer sunny summer day. The problem with the production of electricity being at a different point in the day that when you want to consume it means that you have to store the energy generated. Most PV systems will come with batteries as well as the appropriate control systems. An alternative, assuming you stay connected to the grid, is to sell your surplus electricity made during the day to your electrical supplier and then buy electricity from them when the sun goes down. As most companies will pay you the same amount that you pay for each unit, you should end up with a lower bill. Check that this facility is available in your area and with your supplier before going down this route though. Wind turbines have been in the news lately with micro-turbines becoming available in the DIY stores. You might think that a combination of solar and wind generation would be very complementary, in that when there's not so much light, in the winter months for example, there's a bit more wind. The truth is, however, that unless you live somewhere where there is a steady amount of reliable and accessible wind, these micro-turbines are unlikely to contribute a great deal to your electricity usage. Wind speeds are always faster above ground level, at heights above that of an average house. The disturbance to the wind that's done by all the other roofs around doesn't help either. 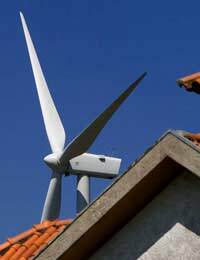 A larger scale turbine on a ridge where it can get clean fast air is more likely to generate a decent return, but then there is also the louder noise to deal with too. Another way of generating electricity that will become available on a domestic scale soon is the use of combined heat and power units (CHP), previously only available for larger installations such as factories, universities and the like. CHPs are small generators, typically running on natural gas but in theory it could be any fuel, that generate electricity in the same way that a portable petrol or diesel one does for remote electricity needs. The difference with these is that the heat that is also produced is channelled to provide heat and hot water for the home. The heat generating part of the boiler is no less efficient than a modern gas boiler so the electricity is essentially available with no extra impact on the environment, in comparison with a boiler that doesn't produce electricity. These units are beginning to become available in the UK from certain utility companies.